Blogging and email marketing are two channels that aren’t always automatically used together – be it by companies with commercial blogs or full-time bloggers. But when it comes to having and growing a blog, using your email database in a smart way can make the difference between the success or stagnation of your readership. Regardless of what type of blog we talk about, the challenges people face when managing a blog tend to be the same old usual suspects. How do I get people to come back for more content? How do I encourage reader loyalty among my visitors? How do I get my blog to the point in which I can monetize it? It’s only natural to want to grow your blog – both in traffic, loyal readers, and monetarily. Part of why this can be very difficult is that in the digital era things keep changing, evolving at the speed of light. SEO rules are updated constantly, social networks rise and fall, even the very way people look for and digest information is changing. However, there’s a silver lining: no matter what, we all have at least one email account and the vast majority of us check it every day. It’s a popular channel and its popularity has only increased over time. This makes email marketing a great way to not only stay in touch with your readers but to effectively drive traffic back to your blog. These are all the reasons you should employ email marketing tactics. Yes, if you collect emails from your readers you’ll have a nice way of reaching them whenever you like. But as a blogger, you need to see beyond that fact and into the real upsides. Consider social media networks, such as Facebook. You can have a Facebook page with millions of followers and it can look like a great way to distribute content – but once your post is online, there’s no knowing who saw it, who clicked it, or who ignored it. There’s very limited feedback on how your post actually performed, and the impact it had on your readership. One of the greatest advantages of any email marketing software is that it will offer you a variety of metrics and statistics after each email blast you send. These statistics will clearly show if your goals have been met, if your subject line is interesting enough if you’re offering content that people want to read. Blogs need to be specific nowadays. The internet is a wonderful place, but it becomes more crowded with blogs with each passing day. Internet users are faced with a surplus of information and content every time they connect to the web, and so it should come as no surprise that people are becoming more and more selective about how they dedicate their time online, to what they pay attention to. Your blog needs to have a clear topic, one area which you can explore all that relates to your core subject. Imagine a blog that deals in healthy food. While your all your content shares the same base, articles are bound to vary a lot. After all, there are so many different types of healthy food! This is true no matter what area you focus on. And this can mean that readers come to your blog looking for a specific aspect, a narrow margin of content which deals directly in their interests. Use this fact to select the content you send your subscribers. With the help of your email marketing program, keep an eye on which links people click on. This will tell you what they want, what they truly like from all the content you offer in your blog. Use this as segmentation criteria, and include more of that same type of content in your next newsletter to the segment. This will spare people the trouble of looking for articles among all the content in your blog and will keep them coming back. People often go through a whole journey before deciding if they are going to make a purchase or not. Logically, the time this journey takes, as well as the kind of content you need to speed it up can vary a lot from sector to sector – buying a lighter online isn’t quite the same as hiring a translator to deal with your app’s entry to a new market, is it? But the fact is that people need information to make a decision. They need more details on what you offer, how you measure up to the competition, context of your brand, and even inspiration to buy something. And while before this would have taken a long time, the internet makes it possible to read all you need within one day depending on what you’re considering to buy. 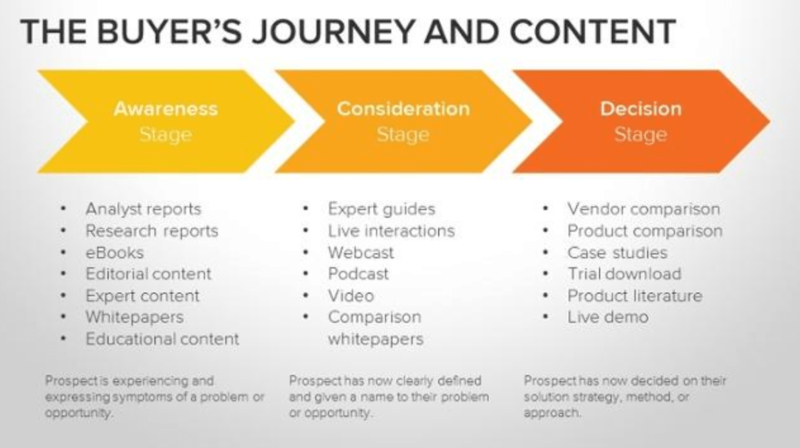 Credits to Julie Kukesh, on Hubspot for making this great illustration of the buyer’s journey. As you can see, we go from general content to more specific content towards the purchase – and you should use this to segment your leads. Does your WordPress website have any available eBooks? People who download those are probably at the beginning of their journey and call for more general material exploring your product/service. Use everything you know about your readers in order to classify them according to the stages of the journey, and you’ll be able to use your blog content to encourage your leads to advance, with the goal of reaching the point of purchase. This has the double benefit of consistently bringing people back to your blog to read your content, and at the same time slowly motivating people to make up their minds to buy your product. Your blog can benefit from having people who keep coming back to read it – and email marketing has a lot of potential to get people to click on your links and return to your platform. But it’s not without its tricks and secrets. So far, we’ve focused on selecting and distributing your content – which is a vital part of both growing your blog and enjoying good results from your email campaigns – but that’s only half of the effort you need to invest. Email is incredibly popular, and people get much more emails than they can or want to read – which is why you need to make your email stand out among the sea of messages your readers surely get. Dedicate time to your subject line: the subject is the only hook you have to make people open your email. There are email marketing professionals out there who claim that the subject line is even more important than the very content your email delivers. We wouldn’t go that far, but it’s easy to see the reasoning behind the claim: what good is it having amazing content if people don’t even open your messages? You can make your subject more attractive by customizing it so that each recipient sees their own name in the subject. This has a large impact on your opening rate and will catch people’s eye when scrolling through their inbox. Make sure you don’t make your subject too long – while computer users usually have about 50 characters to display the subject line in their inbox, smartphones have less. Invest effort into your segmentation and customize everything you can! People don’t want emails that read like they were crafted by a computer system. Think that each email needs to address and talk directly to the reader – and this is just impossible without a professional email marketing solution. Before you go customizing emails, you’ll need a very well organized database or contact list. Remember that the form you use to have people subscribe needs to ask for certain information depending on where you want to take your email marketing. Names and surnames are just as necessary as email addresses – but other data like birthdays, gender, and profession can be of great help too. Make your emails an extension of the visual identity of your blog. This is where a lot of bloggers go wrong – your email campaigns need to have a design that will clearly remind recipients of your blog. Fortunately, most email marketing tools out there offer a set of templates which are ready to use – but it’s up to you to change and modify the visuals until your email is closely related to the look your blog has. Ignoring this step can result in people not making the connection between email and blog automatically – which will leave them wondering who you are, and just why you’re sending them emails. This will cause your recipients to unsubscribe, be disengaged, and even mark you as spam. Your final goal here should be uniformity between design, visuals, layout, and speech between your blog and your email marketing campaigns. Rebeka Costa has always had a love for technology. With the rise of the digital era, it has become her goal to help companies go through the digital transformation as painlessly as possible. All too aware of the power of Google, putting businesses on the map is her passion – that, and the art of writing. The post How to Leverage Email Marketing for Better Blog Readership appeared first on Torque.